The brand new single, Got All I Need, is now available! You can find it on iTunes and Apple Music, Google Play, Amazon Music, Spotify, Deezer, and many other digital media outlets. Listen! Enjoy! Share! There’s more to come! Keep an eye out for more music. Grapefruit Cannonball will be doing a direct-to-vinyl session with Brooklyn-based recording studio Leesta Vall Sound Recordings. There are four songs to choose from at the preorder page, all new and all just for you. Your song will be personally performed for you, recorded, and pressed to a 7-inch vinyl. Go to the Grapefruit Cannonball preorder page at Leesta Vall’s website to choose your song. Here’s a message from Jorden announcing this unique and exciting opportunity. Grapefruit Cannonball will be performing at the Keystone Theatre on Saturday, July 21! Harrisburg band Hometime will be supporting. Doors open at 6:00 PM, and the show starts at 6:30 PM. Tickets are $8.00 at the door or in advance. More details are available on the poster. Be sure to come out and support! Grapefruit Cannonball will be out and about again during the spring and summer of 2018! Go to the “Shows” tab to see when and where they will be. Get ready for a rockin’ summer, and stay tuned for any additional dates or announcements! 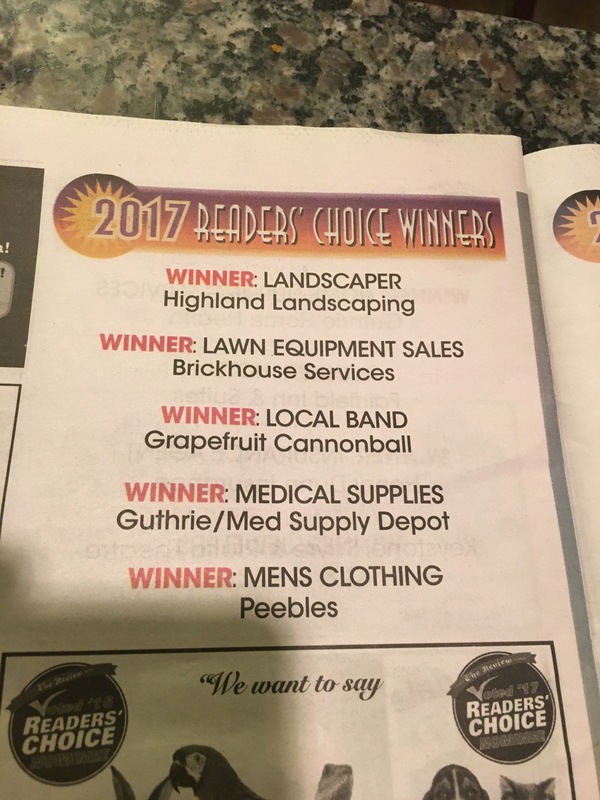 We’d like to thank the readers of The Daily Review in northeast Pennsylvania for voting GRAPEFRUIT CANNONBALL their favorite local band! Thanks for all the support! We’ll see you on November 25 at the Wayside Inn in Towanda! Don’t forget to go to your favorite digital music store and purchase our first single, Bang Bang Bang! Our debut album, IDOL, is on its way! Stay tuned for updates and an official release date. We can’t wait for you to hear it! Our debut album, Idol, coming to CD, iTunes, Spotify and many other music platforms soon. Thanks for another great night, Jabber Jaws Bar and Grille! It was fun! We hope to see you again real soon! Don’t forget. Our first single, Bang Bang Bang, is available NOW on iTunes, Google Play, Amazon Music, Spotify, and wherever you listen to music. Go get it now! We had a blast playing at Andrew Chervak‘s birthday bash! Thanks for the fun night! And a big thanks to Gordon Lauffer for filling in on drums! We hope to see all of you again real soon! We’ll be back in the Lehigh Valley at Jabber Jaws Bar and Grille on Saturday, October 7. Come join us! Don’t forget. Our first single, Bang Bang Bang, is now available on iTunes, Amazon Music, Google Play, Spotify, and many other media outlets. Go buy your own copy of it today! Then keep checking here for updates on when you can buy the song on iTunes, Amazon Music, Google Play, and more! We’d like to take this time to recognize and say goodbye to our drummer, Jarod Boardman. Jarod has decided to step away from Grapefruit Cannonball at this time. We can’t thank him enough for all his efforts throughout the past two years, and we couldn’t have come this far without him! We wish him all the best in his future endeavors! Although we’re down a man, we’re still pressing on! We have some very exciting things coming, so stay tuned!